Create a living room that embodies superior comfort and luxurious designs. Faux leather produces a sleek appeal. Plush, boxed seat cushions, tufted seat-back cushions, and pillowed arms establishes comfortable characteristics, while clean lines and exposed wood feet add to the charming composition. Pair with a matching sofa to enhance your living room decor. The 1250 Loveseat with Pillowed Arms and Exposed Wood Feet by American Furniture at AHFA in the area. Product availability may vary. Contact us for the most current availability on this product. Arm Plush, pillowed arms for superior comfort. Leg or Skirt Exposed wood legs add to style. Bring superior comfort and sleek style into your home with the charming designs of the 1250 group. 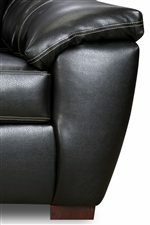 Faux leather produces exceptional characteristics. Plush, boxed cushions, tufted seat-back cushions, and pillow arms provide ultimate comfort, while clean lines and exposed legs add to style. Featuring a sofa, loveseat, chair (not shown) and ottoman (not shown), the 1250 group has all the pieces necessary to enhance your living room decor. The 1250 collection is a great option if you are looking for furniture in the area.